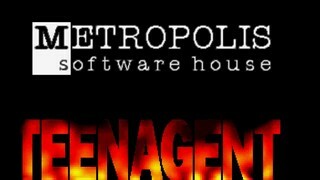 A less-than-household duo of Adrian Chmielarz and Grzegorz Miechowski founded Metropolis Software in 1992. Through the history of that and a later company called 11 bit studios, few of their games, most notably counter-exemplified by 2014's This War of Mine, were critical successes or could be recognized by any of your friends. '95's Teen Agent is another exception, having enjoyed some publicity as a fairly likable point-and-click adventurer. Its star feature has to first prove themselves worthy of entering service in the U.S. military intelligence in the shareware slice of the story, then working out what's happening to the national gold reserves and what Mr. Goldfinger's exact counterpart may have had to do with it, if anything, in the now freeware-distributed latter two thirds.